Does Carpet Cleaning Shrink Carpet? There are many myths about professional carpet cleaning online. One myth is that carpet cleaning ruins carpet. Another myth is that carpet cleaning shrinks carpet. Is it true? Does carpet cleaning shrink carpet? If you hire a certified carpet cleaner it is very unlikely that your carpet will shrink from the service. Reliable carpet cleaning services ensure their technicians and employees receive the proper training to deliver successful results that definitely won’t harm your carpet or cause it to shrink. Quality carpet cleaning Fort Wayne companies invest in new equipment too. The nicer and newer the equipment the less likely any damage to carpet will occur. You need to be careful hiring cheap carpet cleaners or rental carpet cleaning machines. Cheap carpet cleaners that use portable equipment similar to the machines for rent probably do not have the training and certification to ensure a risk-free service from them. It’s also likely that a cheap service doesn’t upgrade their equipment often. Most cheap carpet cleaning companies use steam cleaning. Steam cleaning uses a lot of water and water left behind in carpet is what can lead to shrinking. The water saturates the carpet fibers and pad and causes shrinking. To be 100% safe and avoid carpet from shrinking you need to hire a well-known trusted service like Chem-Dry of Fort Wayne. Even better, our carpet cleaning method uses almost no water at all. We use 80% less water than steam cleaning. Chem-Dry of Fort Wayne technicians receive constant training in the proper cleaning methods and we upgrade our equipment and invest in new solutions and technologies on a regular basis. No shrinking will occur when you hire Chem-Dry of Fort Wayne. 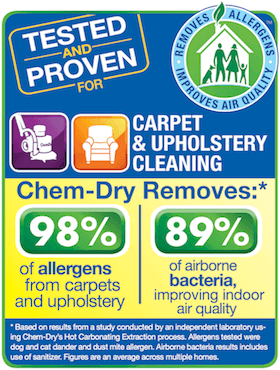 To schedule an appointment from Chem-Dry of Fort Wayne for your home or business, call us at (260) 409-1138.